This is my favorite soup I’ve made the last few winters and I just made my first batch of the season a few days ago. It’s just as good as I remembered! I love making a big pot of it to have ready for dinner or lunch the next few days. I think the curry flavor is a fun twist to a traditional chicken and wild rice soup. There’s just enough curry to add interest, but not completely take over the soup. Plus, it’s much healthier than the usual cream-based version. Instead of dairy, I use coconut milk to add the little bit of creaminess that keeps this soup so comforting. It will come together very quickly once you start cooking, so it’s easier if you get your ingredients chopped and ready to go. This soup is so flavorful and so satisfying, perfect for this time of year! You’ll love it! Start by cooking your wild rice according to directions on the package. Once the rice grains are just about to start popping open, take them off the stove and drain out any extra water. The rice will continue to absorb water in the soup, so I like to try to slightly under-cook it, maybe 5-10 minutes less than the directions call for. Once you’ve got the rice going, start chopping all of your vegetables and chicken. Heat the olive oil in a stockpot over medium-high heat. Add the onion, carrot, celery, and garlic and cook until the onion is softened for about 5 minutes. Stir occasionally to keep the vegetables from sticking or burning. Then, add the chicken broth, coconut milk, chicken, and spices. Stir so that everything is combined and continue cooking on medium-high heat until the soup starts to boil. Cover the pot, reduce the heat to low and let it simmer for about 15 minutes (or until the rice is done) so that the flavors blend. After it’s simmered, turn off the heat and stir in the rice and bell pepper. Sprinkle with cilantro (optional) and serve. *You could use rotisserie chicken or leftover chicken breasts that you previously cooked. Alternatively, you could cut-up uncooked chicken breasts into 1/2 inch chunks and add them to the pot in the beginning to the heated olive oil. Stir and cook the chicken until it’s lightly browned, then add the onion, carrots, etc. Before nectarines are out of season, you HAVE to try this recipe! It is super healthy, quick and easy to make, and so refreshing! You can mix the filling together in 20 minutes and you don’t even need to turn your oven on if you buy pre-cooked chicken. It’s the perfect summer recipe! It is great for making for yourself, or pretty enough to serve to guests. 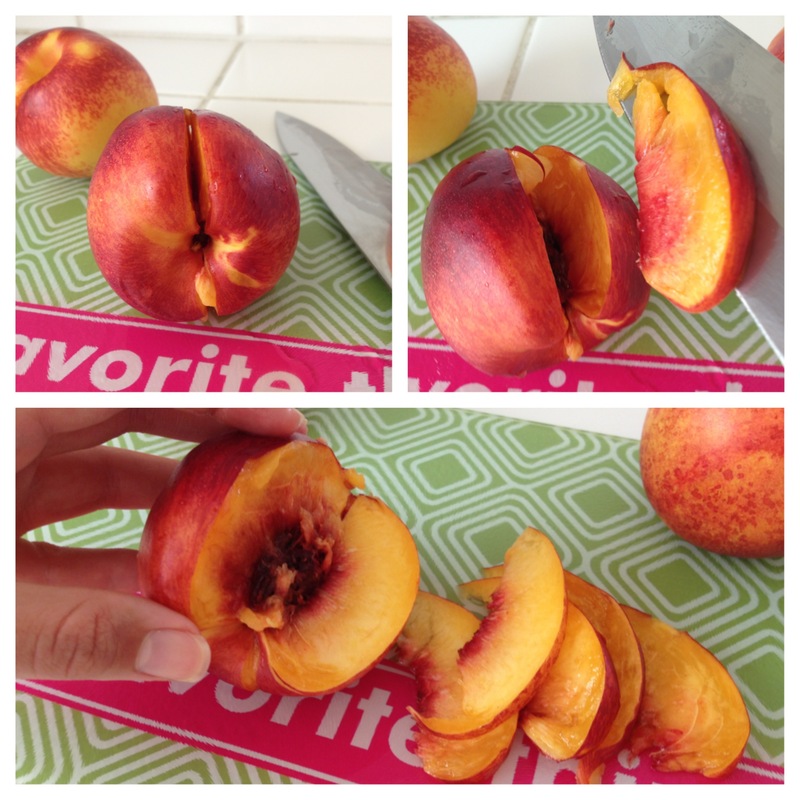 The trickiest part can be cutting the thin nectarine (or peach) slices, so this is how I do it. I first cut a slit from top to bottom, all the way to the pit. Then, I slice another cut right next to the first cut, all the way to the pit. If you get the two cuts close enough together that they meet at the pit, the slice with slide out. You continue make thin cuts, one next to the other, making your way around the whole fruit. 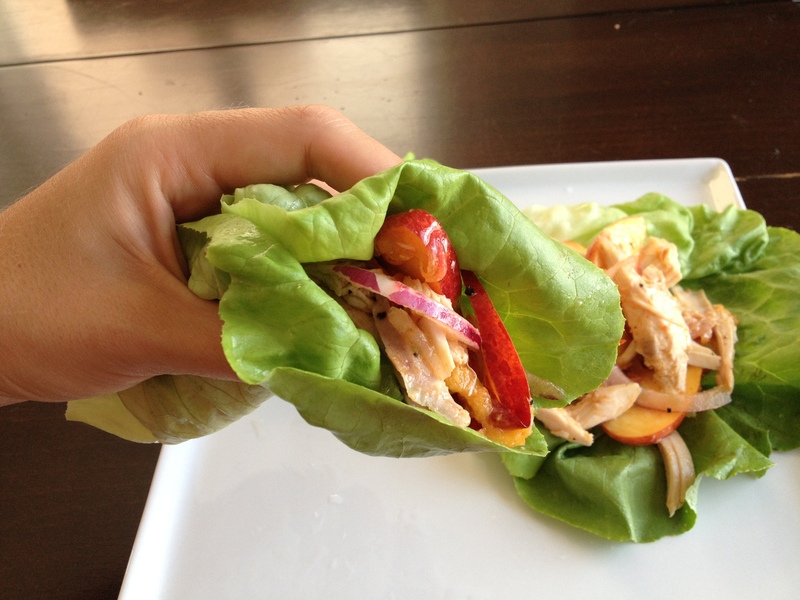 The lime and jalapeno really makes these lettuce cups burst with flavor. They are as delicious as they are pretty! Rinse the butter lettuce so it can dry as you prepare the filling. In a larger bowl, whisk together 2 Tablespoons lime juice, 1 Tablespoon vegetable oil and ½ teaspoon smoked paprika. Add sea salt and black pepper to taste. 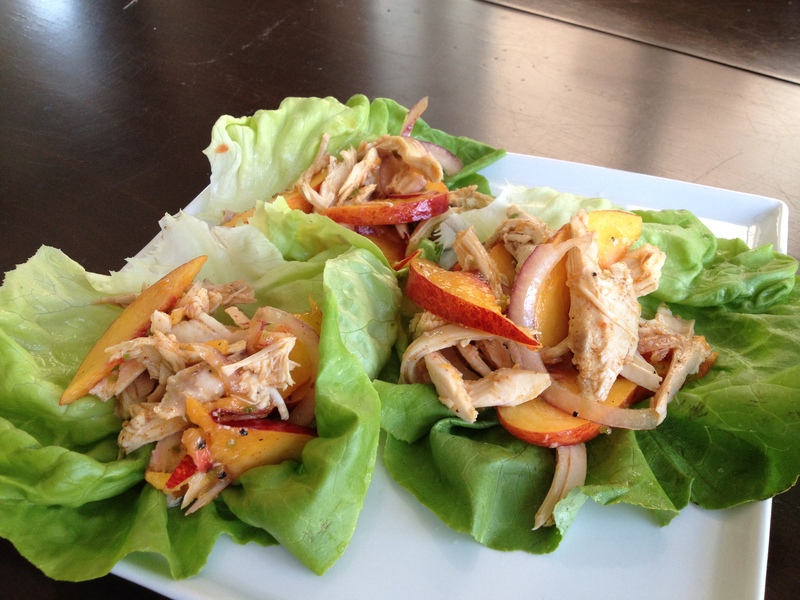 To the same bowl, add the 2 cups of shredded chicken, 2 thinly sliced nectarines, 1/4-1/2 cup sliced red onion, and jalapeno. Stir everything together well and divide among the lettuce cups. You can certainly save the leftovers for the next day, but by the 3rd day, the nectarine slices will start to get pretty soft. If you don’t want to make lettuce cups, you could also put the filling on top of a bed of lettuce for a salad. *I used rotisserie chicken, which made this very quick and easy! If you want to make your own chicken, this is my favorite way to do it: Heat oven to 350 degrees. Rub chicken breasts with olive oil, sea salt, and pepper. Roast for 35-40 minutes or until cooked through. 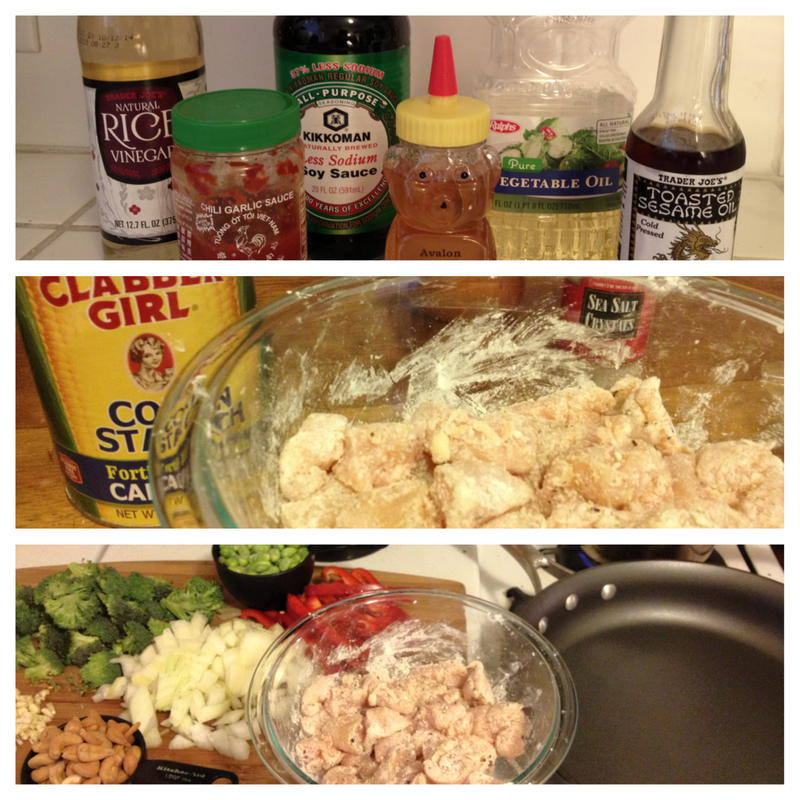 This is hands down, my favorite stir fry to make! Prior to discovering this Honey Cashew Chicken recipe, I used to just haphazardly throw stir fry ingredients into the skillet. Now, this is my go-to dish. I made it for my family over the holidays and they loved it! One of the secrets I learned from this recipe is to coat the chicken in cornstarch before cooking. You will not believe how juicy it keeps the pieces of chicken and also helps bind more of the flavorful sauce to the meat. Don’t be intimated by the list of sauces in the ingredients because you can find almost all of them at Trader Joe’s for relatively cheap prices! Once you have the vegetables chopped and the sauce whisked together, the whole meal comes together very quickly in the skillet. This stir fry reheats very well for either dinners the next few nights or packed lunches. I always love making things that last for several meals! I think it’s best to prep everything first because the stir fry will cook very quickly once you start adding ingredients to the skillet. Combine the cubed chicken in a bowl with the cornstarch, salt, and pepper until the chicken is fully coated. In a separate bowl, whisk together the vinegar, honey, soy sauce, and Sriracha. Chop up all of the vegetables so they are ready to go. Start boiling the rice depending on how long it takes to cook. Add canola and sesame oils to a large skillet over medium-high heat. Sauté the chicken for about 5 minutes or until lightly browned. You will want to make sure to stir the chicken so that all sides get cooked. 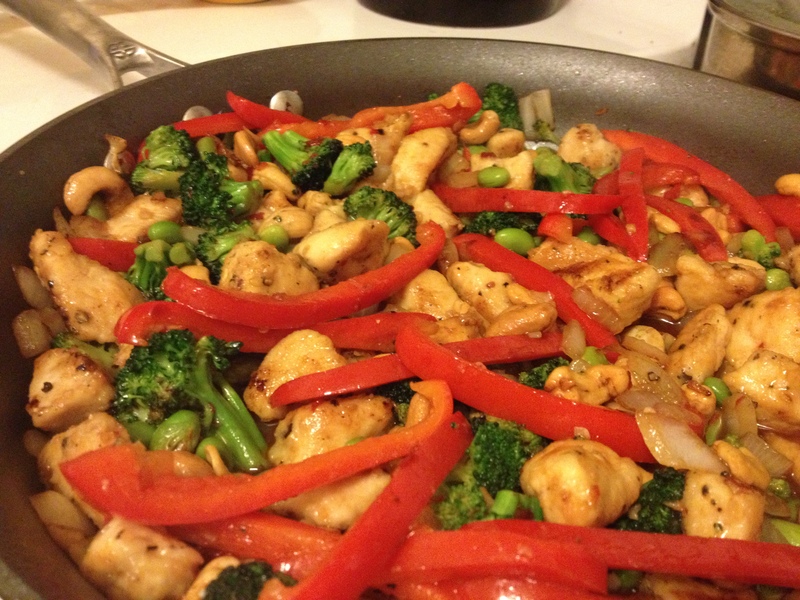 Increase to high heat and add broccoli, edamame, garlic, onion, and red bell pepper. Cook and continue to stir frequently until the vegetables are crisp and the chicken is done, about 5 minutes. Stir in the cashews, pour the vinegar mixture over everything and stir again. Serve over rice. Are you searching for a great meal to make once and have dinner or pack-able lunches for the week? This is what I made yesterday and am looking forward to eating all week! It’s Barefoot Contessa’s Chicken with Tabbouleh. The ingredients are so fresh and it’s satisfyingly healthy. If you can make this ahead, it tastes much better once the flavors have marinated together a bit. I made my chicken and bulgur the night before and then assembled everything the next morning. Also, pay attention to the type of bulgur wheat you are using. I bought quick cooking bulgur wheat, so had to adjust the ratio of water/lemon/olive oil that the bulgur soaks in according to the directions on the package. 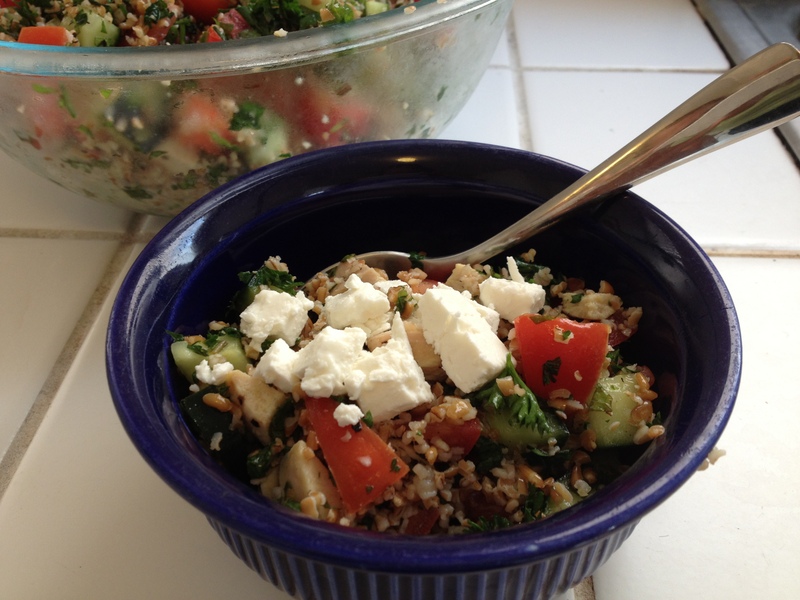 I served mine with some crumbled feta on top – it was the perfect finishing touch! 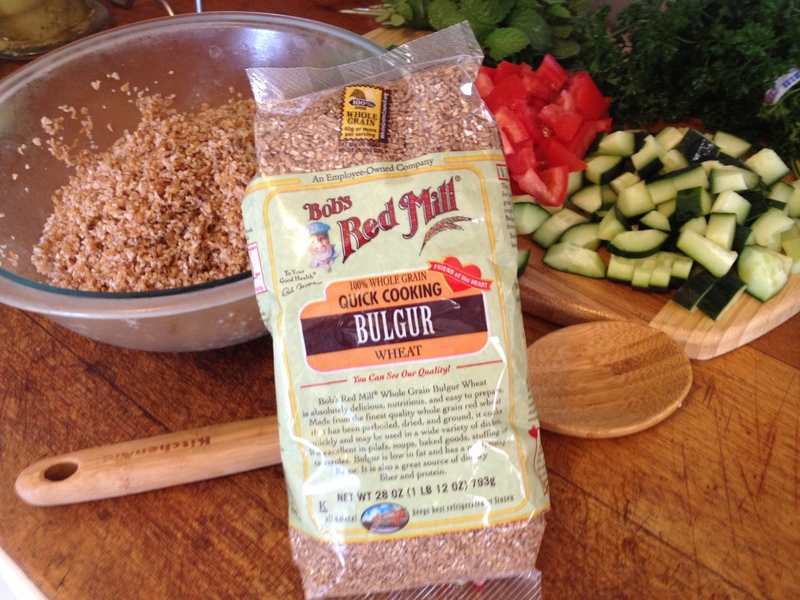 In a heat-proof bowl, pour the boiling water over the bulgur wheat. Add the lemon juice, 1/4 cup olive oil, and 1 1/2 teaspoons of salt. Stir. Cover the bowl with plastic wrap and allow the bulgur to stand at room temperature for about 1 hour. Place the chicken breast on a baking sheet and rub it with olive oil. Sprinkle liberally with salt and pepper. Roast for 35 to 40 minutes, until just cooked. Set aside until cool enough to handle. Remove the chicken meat from the bones and discard the skin. 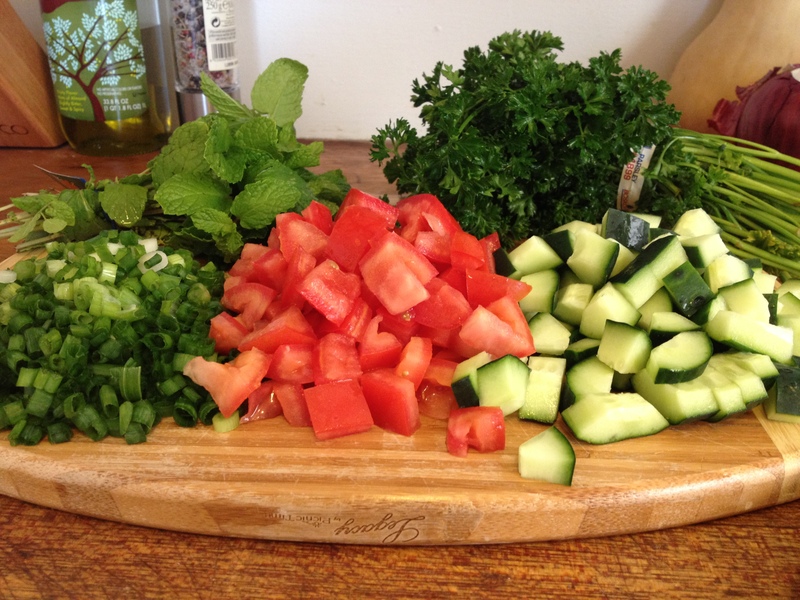 Cut the chicken into medium dice and add to the tabbouleh. Add the scallions, mint, parsley, cucumber, tomatoes, 2 teaspoons salt*, and 1 teaspoon pepper. (*Note: Ina calls for 2 teaspoons salt, but I thought this was too much. Start with 1 and add more later if necessary.) Season, to taste, and serve immediately or cover and refrigerate. The flavors will improve as it sits. 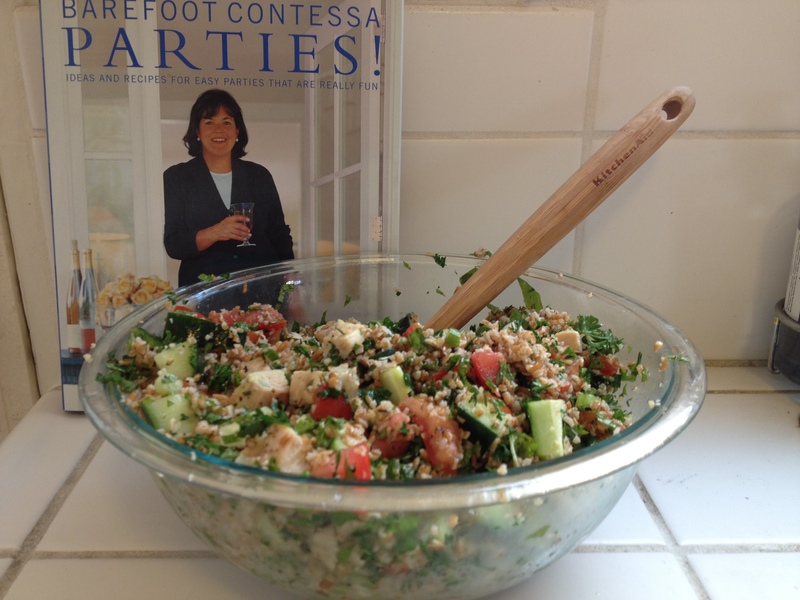 Here is the link to the recipe on food network: Chicken with Tabbouleh or you can find her Tabbouleh recipe in her cookbook “Parties”. I'm Sara and I get very excited to tell people about my latest "discoveries" and favorite things! When I really love something, I can't wait to tell others about why it is the greatest thing ever! You will find a lot of recipes on my blog because I happen to love food and can talk about it forever.